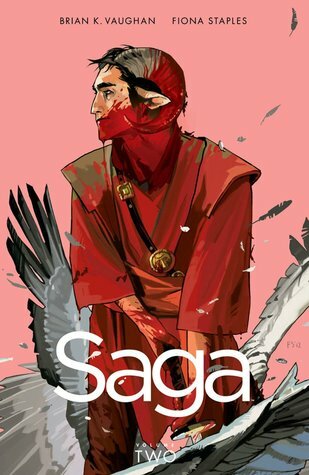 Aside from a brief detour at the beginning–which manages to be an effective recap as well as supplying some new and necessary information–Saga, Volume 2 picks up where Volume One left off. After being tipped off by a bounty hunter looking for information, Marko’s parents manage to catch up to him and his new wife, Alana. Given that Marko’s people and Alana’s have been at war for generations, it was always going to be an awkward meeting but having Alana meet her in-laws in just a towel takes it to a whole new level. This volume delves deeper into Marko’s backstory and takes us through the entirety of his relationship with Alana. There are some lovely moments of connection, not only between Marko and Alana, but also between other cast members. Juggling such a large cast and creating these moments does slow the pace a little compared to the first volume. However, this does not make for a slow story by any stretch of the imagination. Plenty of action and explosions almost invariably follow up any moment of connection. I occasionally wished it would linger a little longer. The characters continued to make the story for me. I was delighted by the introduction of Marko’s ex-fiancee, Gwen, into the mix. She blends competence and ignorance in interesting ways, her emotions running hot and cold. There were some especially interesting exchanges between her and the Will (and Lying Cat), which has me looking forward to discovering what sort of team they will make in the long run. I’m also interested in seeing whether Gwen outgrows the role of scorned woman. The contrasts brought together in Marko’s father, Barr, also made him a favourite. One of the criticisms I had of Volume 1 was the inclusion of bigoted slurs. I was pleased to find this wasn’t a problem in Volume 2 and while there remained some vulgar elements, they were within tolerance for me. In fact, the vulgarity contrasted nicely with some very entertainingly meta commentary on fandom and reading. Volume 2 has definitely cemented Saga as a series I want to continue. I think I stopped after volume 3…for no reason other than not wanting to buy it at the time. I really need to hope back in because I genuinely enjoy this series. So much to mull over! As a comic book fan, you must have a lot to keep up with and I think it’s understandable if you lose track of a couple along the way. You’re right about there being a lot to mull over. It is action-packed but paired with some delicious social commentary and philosophy.